Atlanta CPCU Society is once again walking in support of Cystic Fibrosis at the 8th Annual Cystic Fibrosis walk in Suwanee GA. | Atlanta CPCU Society Chapter, Inc.
Atlanta CPCU Society is once again walking in support of Cystic Fibrosis at the 8th Annual Cystic Fibrosis walk in Suwanee GA. The Atlanta insurance community has once again come together to form Insure the Cure to support the Cystic Fibrosis Foundation. 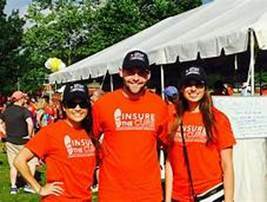 Insure the Cure was formed in 2011 in honor of Clay Snellings’ daughter, Emily. Emily was born with cystic fibrosis, a life-threatening genetic disease that primarily affects the lungs and digestive system. Currently, there is no cure. Since its inception in 2011, the insurance community has raised over $1,400,000. The industry has banded together agencies, companies, brokers and re-insurers who on most days are fierce competitors, but have united to find a cure for Emily and the 30,000 others living with CF. 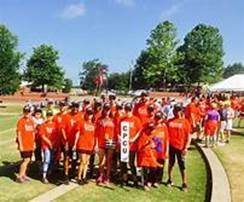 For 2018, Insure the Cure, has set a goal to recruit 60 teams for the Atlanta Great Strides Walk on May19th at Suwanee Town Center. As our key partners across the state of Georgia, we are asking once again for you to join us in the fight for a cure.